Road safety and breakdown organisation GEM Motoring Assist claims UK drink drive limit is too high, and is calling on the Government to take immediate action to reduce it. Fleet operators are becoming increasingly vigilant about 'morning after' drivers being over the UK drink drive limit in their company vehicles, but data from the US suggests even 'minimally impaired' drivers are often blamed in serious collisions. The study, published in the British Medical Journal group’s Injury Prevention, examined nearly 600,000 fatal collisions between 1994 and 2011. It used the official U.S. Fatality Analysis Reporting System (FARS), which reports on blood alcohol content in increments of 0.01%. "Drivers pose increased risks long before they become legally intoxicated," said GEM chief executive David Williams. "The research clearly shows that drivers with a blood alcohol level of just 10mg per 100ml of blood - significantly below the current UK legal limit of 80mg - are 46% more likely to be officially and solely blamed by accident investigators than are the sober drivers they collide with. "Crucially, the authors also found no 'threshold effect;, or sudden transition from blameless to blamed at the legal limit for drink driving. Instead, blame rises steadily and smoothly from 10mg to 240mg." Many of the study’s analyses took advantage of what the authors called a ‘natural experiment’: two-vehicle between a sober and a drinking driver – with unequivocal findings, according to David Williams. “Researchers found no safe combination of drinking and driving, and no point at which it could be deemed harmless to drink alcohol and get behind the wheel of a car. "The data supports the long-running call for reducing the UK legal limit from 80mg to 50mg; and in fact provides good reason for reducing it even further," he added. In 1872 it became an offence to be drunk while in charge of carriages, horses, cattle or steam engines. The maximum penalty was 40 shilling and up to a month’s hard labour. The Road Safety Act of 1967 brought the first drink-drive limit of 80mg, a level which remains today. In 1968, the first breathalysers received Home Office type approval. A 36-year-old woman stopped by police in Redcar in 2013 blew a reading of 275mcg, nearly eight times the legal limit of 35 (equivalent to 80mg of alcohol in 100ml of blood). A Polish driver, tested by police in January 2010, blew a reading of 191microgrammes. A 44-year-old man from East Grinstead blew a reading of 210 for Sussex Police in April 2008. 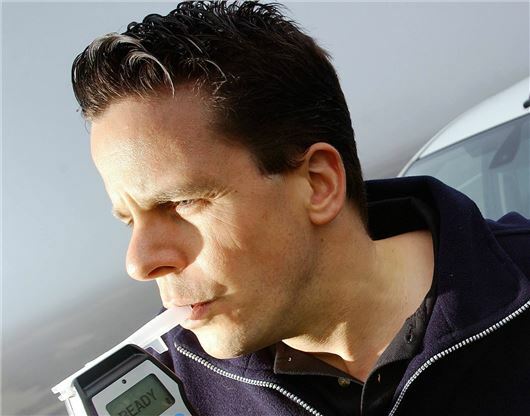 Police in England and Wales carried out 682,558 breath tests in England and Wales during 2012, of which 75,868 were either positive or refused.